Christmas is an expensive time of year as we all know. It is also a time when kiddies love to be involved in the whole ‘giving’ process and homemade gifts can be the perfect answer. With so many family and friends to buy presents for, a personal, homemade gift makes for a proud ‘maker’ and is received with extra special thanks accompanied by lots of ‘oohs’ and ‘aahhs’. So, on a mission to find inspiring homemade gift ideas we came across the wonderful Red Ted Art. 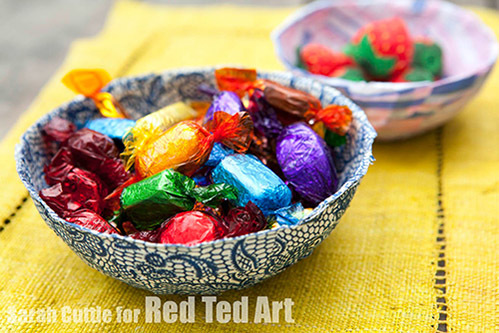 LittleBird love discovering creative inspiration and we think Maggy at Red Ted Arts is a fountain of pure creativity…. Christmas is a wonderful time of year to get crafty – be it to do some lovely “general” Christmas crafts with the kids. But I also like to encourage the kids to make things as gifts to friends and family. Nothing is more special than a homemade gift from a child. Bath bombs a very popular gift in our house – they smell nice, they are useful and they say “we love you, we want to pamper you”. What more could you want. 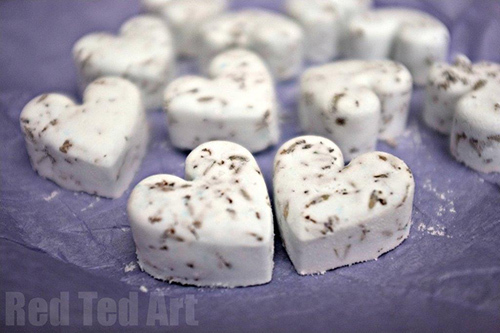 We have a great recipe for how to make Bath Bombs to share with you. Paper weights are a “classic” gift for kids to give their Dad or Grandpa (along with a Picture Frame!). 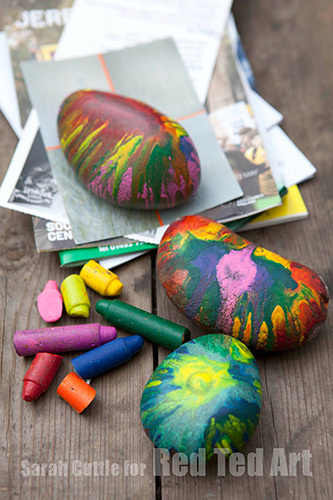 These Rock Paper Weights look fabulous and are seriously fun to make! Yep, these bowls are made from Fabric. Aren’t they gorgeous? All you need is some pretty left over fabric scraps – an old shirt or similar and off you go to make this pretty Fabric Bowl gift. Great for loose change and keys. Is there are Gardner in the family? Or someone that just loves plants, whether indoors or outdoors. 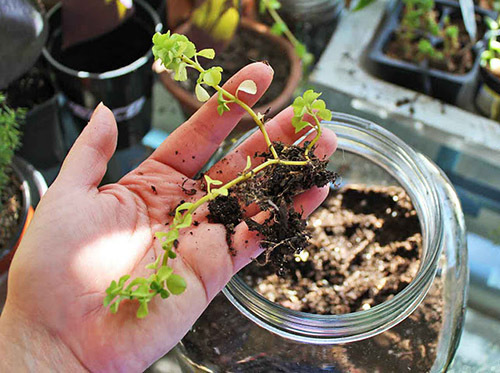 Make a “mini garden in a jar” or a terrarium – a wonderful addition to any desk or mantel piece. What any childhood that doesn’t include Saltdough is imcomplete. 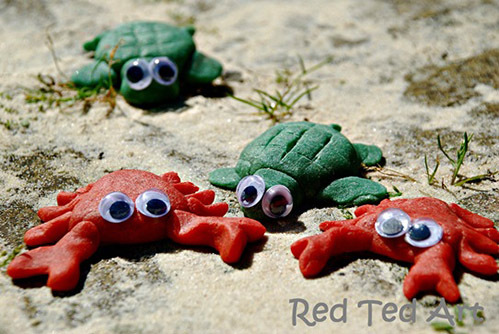 This simple to make craft material, can be turned into so many different fun ideas. We love making Fridge Magnets at Christmas. Wonderful! Check out our fail proof Saltdough recipe! Now your kids have used up all your craft material.. maybe consider creating a lovely Craft Pack for them, giving the “The Gift of Creativity” instead of adding to the Toy Mountain this year. 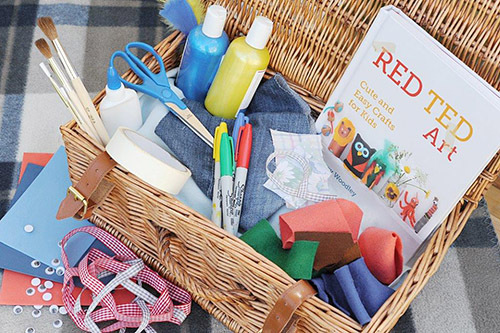 The idea is to create “Basic” and “Jazzed up” Craft Kits that you can put together yourself – and then, if you wish, add a copy of Red Ted Art the book and you will have a fabulously creative gift – both original and different! What do you think? You don’t need much in a basic craft kit, especially if you add recycled materials and finds from nature…. Job done! About the Author: Maggy Woodley, is a crafty mum of two! She loves everything about crafts and loves nothing better to recycle and forage for craft materials –making crafts economical and fun. Maggy also writes at Life at The Zoo about cooking with kids, gardening and sciency “stuff” and Theatre Books and Movies for well, theatre, book and movies! Maggy’s craft site, Red Ted Art, is also now being translated into German, Spanish and Russian for more people to enjoy!